Interlining is the general name of the textile lining used in dry-clean garments as well as in washable clothes, dresses, blouses and shirts. Interlining is used both in larger parts of the said items such as the shoulders, yokes, front panels, foldable and joinable parts and also in smaller parts like the collars, waists and cuffs. 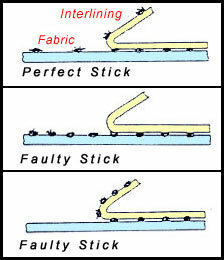 1- Compatibility of the lining and the type and finish of the fabric. 2- Compatibility of the lining with the purpose of the garment and the part of the garment in which it is to be used. 3- Compatibility with the characteristics of the desired feel of the cloth. 4- Compatibility with the desired resistance to washing, dry cleaning, ironing and drying. 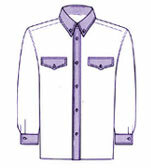 5- Compatibility with the type, cut and colour of the garment. 6- The ability of the lining once put into place not to change the quality of the fabric. 7- The importance of carrying out preliminary tests on the fabric sample. a. 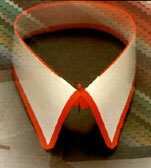 First and foremost, you should be sure that the appropriate type of lining is used for the fabric. b. The fabric and the lining should be placed one on the other lengthwise in such a way that their directions match. c. Sufficient heat should be applied for the sticking. d. You should perform in adequate pressure degrees. The low pressure decreases the heat transfer and permeability and consequently the strength of adhesion, resistance to washing and dry cleaning are reduced. To the contrary, high pressure causes the fabric to show the traces of glue and this effects touch, resistance to washing and dry cleaning negatively. e. Sufficient time for the sticking process should be applied. f. In the event that a pressing machine does not exist in the workplace and the process will be done with an iron, the iron should be pressed on the fabric without rubbing and without using any steam and the pieces should be processed one by one. g. The dimensions of the lining to be applied should not be larger than the dimensions of the fabric. Otherwise, the excess lining soils the tape while passing through the machine and the glue is transferred onto the next piece of fabric. 7- Strength of separation (degree of adhesion). 8- Resistance to washing, dry cleaning and steaming.